Ready to turn your passion for photography into a viable business and profit while doing what you love? 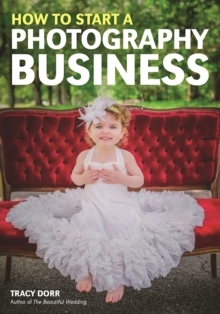 In this book, award-winning portrait and wedding photographer Tracy Dorr (from Williamsville, NY) shows you how to visualize your perfect business and execute the necessary steps, one at a time, to reach your every goal. Youll learn how to choose a specialty that suits you and gain experience in your chosen field. Youll also discover the perks and drawbacks of small vs. large studios, learn how to choose the right studio location, and find tips for managing the business end of the profession from hiring employees, to creating contracts, to taking tax deductions, and more. Dorr also shows you how to grow your business via word-of-mouth referrals, social networking, and developing an attention-getting marketing and advertising plan. In addition to sharing her insights on every aspect of starting and operating a thriving photography business, Dorr includes tips from pros across the U.S. Youll get varied perspectives on many of the topics covered and, armed with this information, youll be poised to chart a course, tackle obstacles, and achieve professional success.